“Years before the official Civil Rights Movement galvanized countless Americans, the Pepsi Corporation boldly took steps to integrate corporate America from as early as 1940. Based on Stephanie Capparell’s groundbreaking book, THE REAL PEPSI CHALLENGE: The Inspirational Story of Breaking the Color Barrier in American Business, (Wall Street Journal Books/Free Press) this exhibit showcases the plight of the first African-Americans to hold professional corporate jobs in this country. Pepsi-Cola CEO Walter S. Mack headed the call of the black leadership of the day and hired an all-black sales team to sell his cola to American blacks. To pull the first sales team together—two men and a woman—for his then-fledgling business, he hired a black sales manager and invented the concept of the business internship as we know it today. 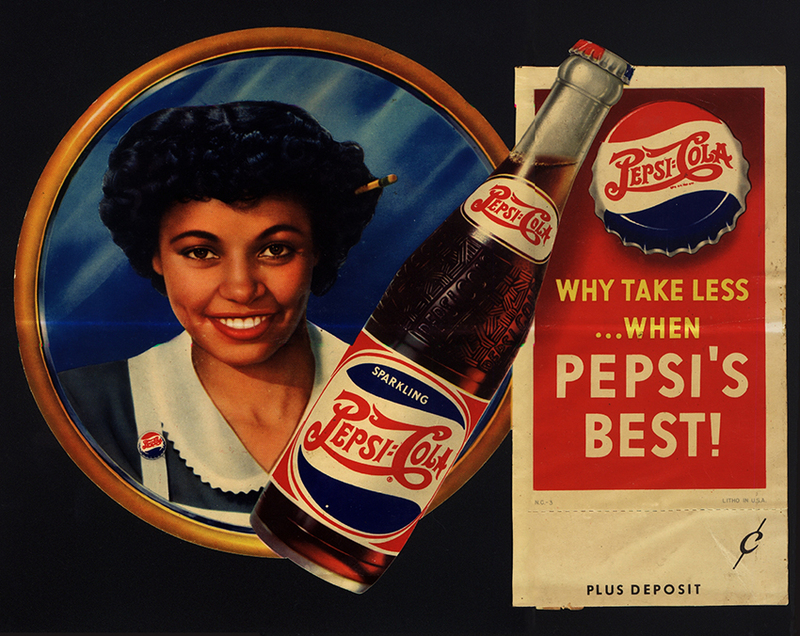 Pepsi’s black sales team members were traveling salesmen in the time of Jim Crow segregation laws, which forced them to sit at the back of buses, travel in separate train cabins, eat behind screens on trains, and find hotels and restaurants that would serve them. In its effort to exploit the untapped special market (some 30 years before niche marketing became a business staple), the team hired some of the first professional black models and designed some of the first advertisements to portray blacks as middle-class citizens enjoying the American Dream. In 1992, team member, Harvey C. Russell, became the first African-American promoted to vice president in a major corporation. Today, in the new millennium, PepsiCo’s female CEO is India-born Indra Nooyi. The exhibit includes a variety of photographs from the private collections of special-markets team members; dozens of Pepsi black-media advertisements from the era; interview transcripts taken from close to 100 hours of voice interviews with seven surviving team members; pages from black weekly newspapers, photocopied from microfilm; and an array of color and black-and-white prints depicting corporate events, meetings and team members then and now.